When you hear the words, "Gaming Mouse," you probably have an image in your head of a mouse that's festooned with buttons, lights, and other gadgets. Normally, that would be accurate, and many of the highest end peripherals do look that way. But Logitech is changing that up with their new "Pro" Gaming Mouse. At first glance, you might be confused, as there's no "G" in the name. That's because Logitech is changing its naming convention for gaming mice. The company is hoping to make its naming more clear and make it easier for gamers to tell which mouse is designed for which market. The Pro is designed specifically for the Pro gaming market. Go figure. Logitech spent considerable time talking and working with professional teams, including Cloud Nine and SoloMid. What the company gleaned from that time is that there is a specific set of features that professional Counter-Strike players want, and the Pro is designed to meet their needs. If you've ever used the Logitech G100s, you'll be very familiar with the new Pro. It's the exact same shape. It may be smaller than some other mice (like the G900 Chaos Spectrum we reviewed previously), but for most gamers, it should be comfortable. I personally found it a bit small, but I have very large hands, so that's not unusual. It's also very light. With a total weight of just 85 grams, the Pro allows for the quick movements at low sensitivities that many CS:GO players prefer. Outside of the shape, the other parts of the Pro are cribbed right from the G303, as that's the mouse that many of the pro gamers Logitech works with prefer. The optical sensor is the highly-regarded PMW3366 that's found in Logitech's other high-end mice, like the G900, G502, and the G303. This sensor has no smoothing, filtering, or acceleration, and can support settings from 200 - 12,000 dpi. 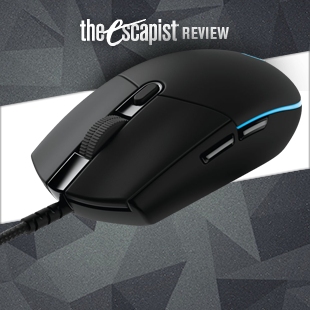 In short, there's very little to dislike about the Logitech Pro Gaming Mouse. Moving past the sensor, you can expect the same spring-tensioned right and left buttons, which many gamers like because of the consistent click feel and minimal bounce. In practice, they feel great, and G303 users won't notice any difference here. Where they might find something different is in the Pro's all new scroll wheel. The new scroll wheel is mechanical, but it has a bit less tactile bump while scrolling than the G303. It's also wider and flatter, making it feel much easier to land on that the G303 wheel. There's no free-wheeling option like the G900, though. The Pro also sports onboard memory, so you can store all your personal settings right on the mouse, so you're all set to game no matter which PC you plug into. There are six programmable buttons on the Pro, including the left and right click, the scroll wheel, a button below the scroll wheel, and two buttons on the left side. It's important to note that while this mouse is symmetrical, those side buttons are only on the left side of the mouse, so lefties will want to be sure they can live without them. As usual, Logitech's gaming software is solid. You can easily set up your mouse to be just about any color you think of. You can have five levels of DPI presets, and switch quickly between them with the press of a mouse button. It also allows you to bind every mouse button to any action, whether it's a traditional command or a multi-key macro. Also included is the surface-tuning ability that was first included with the G502. With this, you can tune your mouse to work well on almost any surface. In short, there's very little to dislike about the Logitech Pro Gaming Mouse. It's lightweight, full-featured, and works flawlessly. About the only caveat is for those gamers who already own the G303. 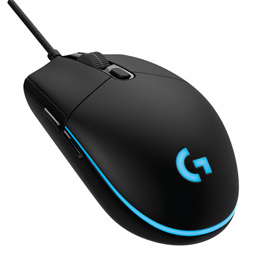 There's not much difference between the G303 and the Pro, except that this mouse is shaped slightly different. Unless you're looking for a replacement, it's likely not worth making the switch. If you don't own the G303, and you're looking for a lightweight mouse with pro-level features, the Pro is definitely worth your time. At $69.99, it won't break the bank, either. Bottom Line: The Logitech Pro Gaming Mouse has all the features it needs without being extravagant. You might not be a pro gamer, but you can definitely use a pro gamer's mouse. Recommendation: If you're in the market for a high-end mouse that's lightweight and accurate with pro-level performance, you can't go wrong with the Logitech Pro Gaming Mouse.